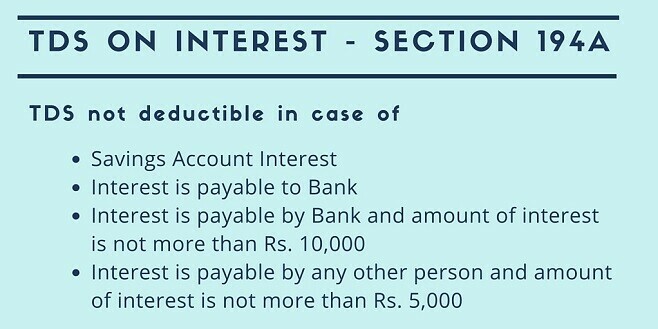 Section 194A of Income tax act contains provisions regarding TDS to be deducted on interest payable like interest on fixed deposit, interest on unsecured loan. Interest on securities are not covered under this section but covered under Section 193. TDS is required to be deducted under this section for payment made for interest to a resident person. TDS is deducted under section 194A only when payment is made to a resident, if such payment is made to non-resident then tax is to be deducted under section 195. Individual and HUF who are liable to audit under audit under section 44AB in the preceding year. However only individual and huf who are liable for audit due to point (a) and (b) in section 44AB are required to deduct TDS. TDS is to be deducted at the time of payment or credit to the account of the payee, whichever is earlier. Where any amount of interest is credited to any account whether called Interest payable account or suspense account or any other name, provisions of this section shall apply and tds is to be deducted. TDS is to be deducted at the rate of 10%. If the recipient of income doesn’t furnish his PAN to deductor then TDS is to be deducted @ 20%. No surcharge, education cess or SHEC shall be added to the basic rates. Section 194A of income tax act provides for deduction of tds on payment made regarding interest. For example if bank pays Rs. 15,000 interest on fixed deposit to a customer. Since the amount is more than Rs. 10,000, bank is liable to deduct TDS @ 10% on the whole amount of interest i.e Rs. 15,000. Even is such amount is not actually paid and only credited to customer account then also TDS is to be deducted. 10,000 where the payer is a banking company, any bank, banking institution, co-operative society engaged in the business of banking, post office (on deposit under scheme framed and notified by Central Government). Such amount is calculated branch wise if such institution adopted core banking solutions. 5,000 in any other case. Interest credited or paid by a firm to a partner of the firm on partner’s capital. Interest is paid or credited to any banking company, co-operative society engaged in banking business, public financial institutions, LIC, Unit Trust of India (UTI), a company or co-operative society carrying on the business of insurance or any institution Central Government notifies. Interest is paid by paid by a co-operative society (other than a co-operative bank) to a member thereof or to such income credited or paid by a co-operative society. Interest is paid or credited in respect of deposits under scheme framed by Central Government and notified in official Gazette. To such income credited or paid in respect of deposits (other than time deposits) with a banking company or co-operative society carrying on business of banking. In other words, saving account interest is not liable for tds deduction. Interest is paid by Central Government under any provisions of the income tax act or wealth tax act. Income credited or paid in respect of deposits with primary agricultural credit society or co-operative land mortgage bank or co-operative land development bank. Interest paid on compensation awarded by the Motor Accidents Claims Tribunal where the amount of such income or the aggregate of the amounts of such income credited or paid during the financial year doesnot exceed Rs. 50,000. Such interest if credited and not paid then whole amount of such interest credited without any condition. Interest is in relation to zero coupon bonds. Interest referred to in section 10(23FC). Discounting charges on export bill discounted is not treated as interest and thus not liable for tax deduction under section 194A. The recipient can stop deduction of TDS on interest income by filling Form No. 15G/15H to the payer. TDS is deductible under section 194A from payment made for interest (other than interest on securities). Now the question arises whether TDS is also deductible when interest is payable due to delayed payment to suppliers. 2(28A) – ” interest” means interest payable in any manner in respect of any moneys borrowed or debt incurred (including a deposit, claim or other similar right or obligation) and includes any service fee or other charge in respect of the moneys borrowed or debt incurred or in respect of any credit facility which has not been utilised. From reading of the above section it can be concluded that interest paid for delayed payment of purchase bills cannot be considered as interest for income tax act. Similar view has been taken by the Hon’ble Tribunal (Hyderabad Bench) in case of Sri Venkatesh Paper Agencies (Hyd.) Pvt. Ltd. vs. DCIT. [ITA No. 636 of 2011]. Therefore it can be concluded that such interest doesn’t fall under section 194A and therefore no TDS is deductible under such a case.